The 2010 Guinness Book of World Records Gamer's Edition features a list of the Top 50 video game series as voted by the gaming public. 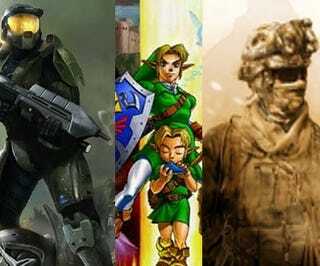 Which series came out on top between The Legend of Zelda, Call of Duty, and Halo? Instead of opting to go with game review scores or a board of experts, this year Guinness put the top 50 video games series category in control of the players. A noble sentiment, but one that leads to results that scream popularity contest. For instance, Halo received more than 13,000 votes, putting it in the number one spot, while Call of Duty took second and The Legend of Zelda, the longest-running franchise of the three - took third. "We decided to take a different approach with this list than we did in the previous edition," said Guinness World Records Gaming Editor Gaz Deaves. "Instead of asking developers, industry insiders and journalists to rank their favorite titles, we approached a different kind of expert: the players themselves! We are confident that this 'top 50' more accurately reflects the tastes of the average gamer and not just the critics." Like I said, a popularity contest. Here's the rest of the list, from Guitar Hero all the way down to Pro Evolution Soccer.